Syed Jalaluddin Surkh-Posh Bukhari (Urdu: سید جلال الدین شرخ پوش بخاری‎, c. 595-690 AH, 1199–1291 CE) was a Sufi saint and missionary and was one of our ancestors. He was a follower of Baha-ud-din Zakariya of the Suhrawardiyya order. Bukhari died on the 19th day of the 5th month (Jumada al-awwal) 690 AH (20 May 1291 CE) in Uch, Punjab aged 95. Bukhari, a family name, is derived from his birthplace, Bukhara, in modern Uzbekistan. Bukhari is a Sayyid, a male who is a descendant of Muhammad. Bukhari’s ancestors were Muhammad’s grandsons, Hasan ibn Ali and Husayn ibn Ali. Bukhari was bornJalaluddin haider. However, he has a number of names and titles. He is known as Jalal Ganj; Mir Surkh (Red Leader); Sharrif ullah(Noble of Allah); Mir Buzurg (Big Leader); Makhdum-ul-Azam; Jalal Akbar; Azim ullah (Azim? of Allah); Sher Shah (Lion King); Jalal Azam and Surkh-Posh Bukhari. With formal honorifics, Bukhari is known as Sayyid Jalaluddin; Mir Surkh Bukhari; Shah Mir Surkh-Posh of Bukhara; Pir Jalaluddin Qutub-al-Aqtab; Sayyid Jalal and Sher Shah Sayyid Jalal. Bukhari was known as Surkh-posh (“clad in red”) because he often wore a red mantle. Bukhari was born on Friday, the fifth day of the twelfth month (Dhu al-Hijjah) of the year 595 AH in Bukhara, in present-day Uzbekistan. Bukhari was the son of Syed Ali Al-Moeed and the grandson of Syed Ja’far Muhammed Hussain. Bukhari’s early education was provided by his father. He was later influenced by syed shahjamal mujarad.of kohlapur in modern-day India. His descendants are called bukhari because of him. Bukhari’s first wife was Syeda Fatima, daughter of Syed Qasim. Bukhari and Fatima had two children, Ali and Ja’far. In 635 AH, after Fatima’s death, Bukhari moved with his two sons from Bukhara to Bhakkar. Ali and Ja’far are buried in Bukhara. In Bhakkar, Bukhari married Bibi Tahireh (Zahra), daughter of Sayyid Badruddin Bhaakri, the son of Sayyid Muhammad Al-Makki. Zohra and Bukhari had two sons: Sadruddin Mohammed Ghaus (who moved to the Punjab) and Bahauddin Mohamed Masoom. Their descendants live in and around Thatta, Uch (Deogarh) and Lahore. A daughter of Sadruddin Mohammed Ghaus married Jahaniyan Jahangasht. After Zohra’s death, Bukhari married the second daughter of Badruddin Bhakkari, Bibi Fatima Habiba Saeeda. They had a son, Syed Ahmed Kabir (Ahmed Kabir), who was the father of Jahaniyan Jahangasht and Makhdoom Sadruddin. It is mentioned within books of history that Sayyid Sadruddin, Sayyid Maah and Sayyid Shams who were the brothers of Sayyid Badruddin objected to him marrying his daughters to Bukhari and exiled him and Bukhari from Bhakkar. Bukhari’s life was spent travelling. As an Islamic missionary, he converted tribes such as the Soomro, Samma, Chadhar, Sial, Daher and the Warar. Bukhari was one of the Chaar Yaar (not to be confused with the Rashidun). The Chaar Yaar were the group of pioneers of the Suhrawardiyya Sufi and Chisti movements of the 13th century. Bukhari founded the “Jalali” section of the Suhrawardiyya order of Sufi. He converted the Samma, the Sial, the Chadhar, the Daher and the Warar tribes of the Southern Punjab and Sindh. Some of his followers (mureed) spread to Gujarat. The mureed included Bukhari’s grandson, Jahaniyan Jahangasht (d. 1384 CE) who visited Mecca 36 times. Other mureed included Abu Muhammad Abdullah (Burhanuddin Qutb-e-Alam) (d. 1453 CE) and Shah e Alam(d. 1475 CE). In 1134 CE, the Sial followers of Bukhari settled in the community that is now Jhang. In the late 17th century, the settlement was washed away. Bukhari’s descendent, Mehboob Alam Naqvi-ul Bukhari Al-Maroof Shah Jewna, encouraged the followers to resettle the area. Many of Bukhari’s disciples are buried in Banbhore and Makli Hill near Thatta. In 642 AH, when Bukhari had begun his missionary work in Uch, he was visited by Nasiruddin Mahmud of the Delhi Sultanate. Shah Daulah Shahid, is a Muslim saint who is buried in Bengal. In Bukhara, Bukhari presented Saint Daulah with a pair of gray pigeons. From Bukhara, Saint Daulah travelled to Bengal where he battled and was killed by the Hindu king of Shahzadpur. Bukhari’s biography and family history are cited extensively in such works as the “Marat-e-Jalali”, the Mazher-i-Jalali, the Akber-ul-Akhyar, the Rauzat-ul-Ahbab,Maraij-ul-Walayat, Manaqabi Qutbi, the Siyar-ul-Aqtar, the Siyar-ul-Arifeen and the Manaqib-ul-Asifya. These manuscripts are held by Bukhari Sayyids, however the work Marat-e-Jalali was first published in 1918 in books form from Allahabad India and its second edition with updates and more research material was printed as a book in 1999 from Karachi Pakistan. His descendants are called “Naqvi al-Bukhari”. The part of Uch where the family settled is called “Uch Bukharian”. The lineage contains saints and religious leaders. Some moved to Turkestan and were married to the Tatar Mongols. Others moved to Bursa in Turkey and others moved to Bilot Sharif,District Attock (Attock Khurd+village Kamra Kalaan) and District Sialkot (Tehsil Shakargarh in Villages Kotli Shah Saleem Kala Chechi (Kara Chechen), Nurkot, etc.) as well as in the Tribal Areas of Kurram, Orakzai and Kohat. There are a number of tombs of Bukhari descendants across the Punjab, Sindh, Indian Gujrat and Khyber Pakhtunkhwa. They include: Jahaniyan Jahangasht (d. 1308 CE), Baba Shah Jamal in Lahore, Hazrat Baba Shah Saleem and Shah Nazar in Sialkot district and Rajan Qittal, Bibi Jawindi (c. 1492 CE), Bukhari’s great granddaughter and Mir Mohammad Masoom, the forefather of the Bokhari Naqvi family of Dreg, Dera Ghazi Khan and Channan Pir and Wadpagga Sharif in Peshawar. The tomb of Bibi Jawindi and the tomb and mosque of Jalaluddin Bukhari have been on the “tentative” list of UNESCO World Heritage Sites since 2004. World Monuments Fund also promotes its conservation. Bukhari’s son, Ahmed Kabir, had a disciple called Choochak Sial, a member of the Sial tribe. Choochak’s daughter was Mai Heer, of the popularised romantic tragic poem Heer Ranjha. In the Kurram Agency the Jalali leader was Pahlawan Shah. He was the son of Hussain Ali Shah, Fakir ul Fukara. Miracles have been attributed to him. Pahlawan Shah led the resistance against the British Raj in Kurram Agency. In the Orakzai Agency, Bukhari’s teaching was presented by Pahlwan Shah’s elder brother, Gul Badshah. Baba Shah Jamal was a religious leader in Lahore. He was the 7th descendant of Makhdoom Syed Sadruddin Rajan Qattal, who was a son of Makhdoom Syed Sultan Ahmad Kabir Bin Makhdoom Syed Jalaluddin Surkh-Posh Bukhari. Dr Pir Syed Ali Hussain Shah Naqvi Naqshbandi Suharwardi Qadri Qalandri is Khalifa Majaz of Hazrat Shah Jamal and also Gaddi Nasheen Kot Muhammad Sharif, Chichawatni and of Hazrat Pir Ghulam Ali Shah sahib. He is presently in Canada. Ghazi Baba moved to Wadpagga Shareef, Peshawar. The word Wadpagga is derived from the Punjabi language “Wadi” and “Pag”, which means “Big Turbans”. Since the Syeds wore big turbans, therefore the village came to be known by this name. Ghazi Baba was the 15th descendant of Syed Nasiruddin Mehmood, who was a direct descendant of Makhdoom Jahanian. Ghazi Baba was a contemporary of Mian Omar, a saint buried in the village of Chamkani, Peshawar. Ghazi Baba had seven sons, the eldest being Syed Abdul Wahab Shah and the youngest Syed Abdullah Shah. Other sons are, Syed Shah AbdulAziz, Syed Inayat Shah Bukhari.The Shrine of Ghazi Baba is a site of pilgrimage. Bukhari’s descendants in Sindh included famous Sufis. After the death of Hazrat Makhdoom Jahaniyan Jahangasht, Hazrat Makhdoom Mehmood Nasiruddin qalan was declared as Sajadanasheen Makhdoom Jahaniyan. Then, Hazrat Makhdoom Syed Abdullah Burhan u Deen Qutb E Aalam migrated to Gujarat, India. He had a son named Makhdoom Syed Shah Alam. Weedhal Shah (son of Ishaq, who founded Shahpur Jehanian, Nawabshah, Sindh. Moved to Tando Jahania, Hyderabad and had 8 sons). Mehdi was the great great grandson of Kamil Shah. He was a poet who lived in Muhammad Qasim Bughio near the Chowdaggi Hala road district of Matiari. 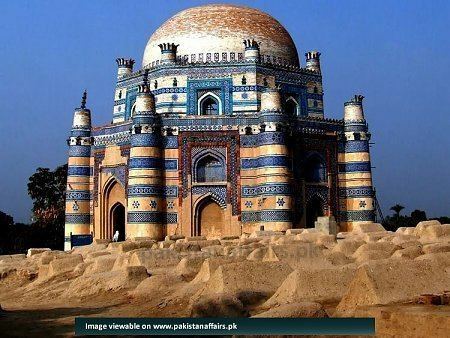 The brick-built tomb measures 18 meters by 24 meters and its carved wooden pillars support a flat roof and it is decorated with glazed tiles in floral and geometric designs. The ceiling is painted with floral designs in lacquer and its floor covered with the graves of the saint and his relatives an interior partition provides purdah for those of his womenfolk. Its mosque consists of a hall, measuring 20 meters by 11 meters, with 18 wooden pillars supporting a flat roof. It was built of cut and dressed bricks and further decorated, internally and externally, with enamelled tiles in floral and geometric designs. The Mela Uch Sharif is a week-long mela (folk festival) held in March – April in Uch. People from the southern Punjab come to honour Bukhari’s role in spreading Islam. Participants visit Bukhari’s tomb, and offer Friday prayers at the local mosque which was built by the Abbasids. The mela commemorates the congregation of Sufi saints connected with Bukhari. It aligns with the Hindu calendar month of Chaitra. Bukhari’s original name was Jalaluddin, kunya Abu Ahmed (ابواحمد), while Mir Surkh, Sharrif ullah, Mir Buzurg, Makhdum-ul-Azam, Jalal Akbar, Azim ulllah, Sher Shah, Jalal Azam and Surkh-Posh Bukhari were his titles. He was also known as Jalal Ganj. He was formally called Sayyid Jalaluddin Mir Surkh Bukhari as well as Shah Mir Surkh-Posh of Bukhara, Pir Jalaluddin Qutub-al-Aqtab, Sayyid Jalal or Sher Shah Sayyid Jalal. He was born on Friday, 5th Dhu al-Hijjah 595 AH (Hijri) in Bukhara, present-day Uzbekistan. He was the son of Syed Ali Al-Moeed and grandson of Syed Ja’far Muhammed Hussain. He got his early education in Bukhara under the supervision and guidance of his father. He completed his education in his seventh year and is known to have performed several miracles even in childhood. 1,500 learned men had accepted him as their spiritual leader before he had actually reached manhood. He spent his whole life in traveling and several tribes, such as the Soomro, Samma, Chadhar, Sial, Daher, and Warar and others adopted Islam owing to his efforts. His first marriage was with daughter of Syed Qasim in Bukhara, who bore Syed Ali and Syed Ja’far he had a total 22 sons. After the death of his first wife, Syeda Fatima in Bukhara, he along with his two sons migrated at the age of forty years from Bukhara to Bhakkar, Punjab in 635 AH (Hijri). However, as per the book “Mukhdoom Jahaniyan Jahangasht” written by Muhammad Ayub Qadri, both the brothers went back to Bukhara after some time. In Bhakkar, he married daughter of Sayyid Badruddin Bhakkari, Sayyida Sharifa BibiTáhirih, with her he had two sons Sayyid Sadaruddin Mohammed Ghaus and Sayyid Bahauddin Mohamed Masoom (their descendants are settled in and around Thatta, Uch and Lahore). One daughter of Sayyid Sadaruddin Mohammed Ghaus was married to Jahaniyan Jahangasht. Later after the death of his second wife he married another daughter of Sayyid Badruddin Bhakkari Sayyida Bibi Fatima Habiba Saeeda. She bore him his youngest son Syed Ahmed Kabir (father of Jahaniyan Jahangasht). Sayyid Jalaluddin Surkh-Posh Bukhari died at the age of 95 years on 19th Jumada al-awwal 690 AH (Hijri) (20 May 1291 CE) in Uch Sharif, Punjab. He also met Chengiz Khan, the Mongol, and endeavoured to convert him to Islam, but Chengiz Khan ordered him to be burnt alive. The fire however turned into a bush of roses and on seeing this miracle Chengiz Khan became inclined to be more sympathetic towards Islam and Muslims. Chengiz offered to give his daughter in marriage to Hazrat Jalaludin. He at first refused to take Chengiz’s daughter as his wife but then he heard a divine voice say that his descendants would spread far and wide and were destined to be Qutubs “saints” of the world, he consented to the marriage. This proved to be true as his descendants are quite numerous, and many Sayyid families in the Punjab, Sindh, the United Provinces (Uttar Pradesh), Kachchh and Hyderabad Deccan, claim descent from him, and trace their origins to Uchch Sharrif. His two male issues from his second wife, Fatima, the daughter of Sayyid Qasim Hussein Bukhari, Sayyid Ali and Sayyid Jaffar, are buried in tombs at Bukhara. He brought his son Sayyid Baha-ul-Halim with him to Sindh and he settled in Uchch in 1244 CE. Sayyid Jalaluddin afterwards married Zohra, the daughter of Sayyid Badar-u-Din Bhakkari, of whom was born Sayyid Mohammad Ghaus. On Zohra’s death he married the second daughter of Sayyid Badar-u-Din Bhakkari, who give birth to Sayyid Ahmed Kabir, the father of Makhdoom Jahaniyan Jahangasht and Makhdoom Sadruddin. Firuz Shah Tughlaq sent the Son of Makhdoom Sadruddin,Syed Hassamuddin Hassan Bukhari to Kara-Manikpur and he is buried in Parsaki or Parsakhi,The Kokhraj(Koh-e-Kharaj)OR Koh-e-Inam in the district of Allahabad (near Kara-Manikpur) and his descendents are presently found in pargana Chail of Allahabad and are known as Naqvi ul-Bukhari Sada’at of Chail ) total he had 22 sons. In 642 AH (Hijri) when Nasiruddin Mahmud, son of Shams-u-Din Altamash, was Sultan (ruler) of the kingdom of Delhi, Hazrat Jalaluddin Surkh-Posh Bukhari reached Uch, which was then called Deogarh, and its people began through him, to embrace Islam. The Raja Deo Singh, its ruler, was greatly incensed at this, and spared no effort to cause him trouble, but being overawed by the Sayyid’s miracles he fled to Marwar. Innumerable miracles are attributed to him. The reverence which he enjoyed may be judged from the fact that rulers used to wait upon him at Uch, for example in 642 AH (Hijri). Nasiruddin Mahmud, the eldest son of Shams-ud-din Altamash, paid him visit at Uch. He died in 690 AH (Hijri) in the reign of Ghayas-u-Din Balban, and was buried at Sonak Bela 3 miles of Uch, but the river Ghaggar reaching quite close to his grave; his descendants removed his remains to Uch and buried them at the place where the shirne Hazrat Sadar-u-Din Rajan Qattal is now situated. Again in 1027 AH (Hijri) the then Sajjada Nashin Makhdoom Hamid son of Muhammad Nassir-u-Din, removed the remains, buried them in the present spot and erected a building over them. In 1261 AH, Nawab Muhammad Bahawal Khan III made some additions to it and built a tank and well, called the khan sir, in compound of the shrine. In 1300 AH, Nawab Sadiq Muhammad Khan IV had it repaired and made some additions. Both Hindus and Muslims in and outside the state have a firm faith in this Khanqah and all kinds of vows are made there. He spread Islam to Sindh and Southern Punjab and is responsible for conversion of Samma tribes among others to Islam. He also laid the foundations of a religious school in Uch (also spelled Uchch). He moved back to Bukhara once and later returned to finally settle in Uchch in 1244 CE. He was founder of the “Jalali ” Section of the “Suhrawardiyya” Sufi Order, “Jalali” being named after him. Some of his successors in the line went to Gujerat and became very famous there. This includes Jalaluddin bin Ahmad Kabir, popularly known as Makhdoom Jahaniyan Jahangasht (d. 1384 CE), who made thirty-six visits to Mecca; Abu Muhammad Abdullah, popularly known as Burhanuddin Qutb-e-Alam (d. 1453 CE) and Sayyed Muhammad Shah Alam (d. 1475 CE). It is narrated that Makhdoom Syed Jalaluddin Bukhari had urged Genghis Khan to spare the innocent people and embrace Islam. Enraged by this bold act of Jalaluddin, Genghis Khan ordered that he might be thrown in fire. But to the utter surprise of Genghis Khan and his courtiers the fire did not hurt Jalaluddin Bukhari. It is said that 17 leading tribes of Punjab accepted Islam at the hands of Baba Farid. Some of these tribes were Kharal, Dhudhyan, Tobian and also Wattu, a Rajput tribe. Hazrat Jalaluddin Surkh-Posh Bukhari converted the Samma tribes of Sindh as stated earlier, the Sial, Chadhar, Daher and Warar tribes of Southern Punjab and Sindh, and several other tribes while Shahbaz Qalandar had a great following in Multan and Northern Sindh. Present city of Jhang is also said to have been founded by Hazrat Jalaluddin Surkh-Posh Bukhari (in 1134 CE according to some sources). Its first inhabitants were Sials who were followers ( mureed) of Hazrat Jalaluddin Surkh-Posh Bukhari . It was then destroyed by the river and re-founded during the reign of Aurangzeb by his descendant Syed Mehboob Alam Naqvi-ul Bukrari Al-Maroof Shah Jewna who asked his (mureed) followers to settle again in that area. He is also reported to have met Makhdum Shah Daulah, a saint buried in Bengal, at Bukhara where he presented Makhdum Shah Daulah with a pair of gray pigeon (Common Indian gray pigeon) as a token of good wishes. From Bukhara the Makhdum Shah Daulah party proceeded towards Bengal and settled at Shahzadpur, a locality under the jurisdiction of a Hindu king whose kingdom extended up to Bihar. The king ordered for the expulsion of Makhdum Shah Daulah and his companions. Consequently there ensued a severe fight between the two parties in which Makhdum Shah Daulah with all his followers, except Khwaja Nur, embraced martyrdom and is buried beside the old Shahi mosque at Shahzadpur. Mai Heer of the Sial tribe and of the “Heer Ranjha” fame was daughter of Choochak Sial who was disciple of Hazrat Syed Ahmed Kabir, son of Hazrat Jalaluddin Surkh-Posh Bukhari. Sayyid Jalaluddin Surkh-Posh Bukhari was Naqvi Sayyid. “Syed” or “Sayyid” is an honorific title that is given to males accepted as descendants of Muhammad through his grandsons, Hasan ibn Ali and Husayn ibn Ali, who were the sons of his daughter Fatimah and son-in-law and Caliph Ali ibn Abi Talib. Whereas Naqvi is a family name used by the “Syed” or “Sayyid” who are through the lineage of Ali al-Hadi (Arabic: الإمام علي الهادي). His family was one of the most revered and prominent Muslim families during the rule of the Turkish dynasties in India including the Tughlaq and Mamluk dynasties of Delhi. His descendants are called Naqvi al-Bukhari. The part of Uchch where this family settled is called “Uchch Bukharian” to this day.Some of his family members migrated to Biloot Sharif and the Tribal Areas of Kurram, Orakzai Agency and Kohat District. The well known spiritual head of the Bukhari’s Syed in Kurram Agency was Syed Pahlawan Shah who was the son of Syed Hussain Ali Shah popularly know in the spiritual circles as Fakir ul Fukara. While in Orakzai Agency Hazrat Jalaluddin Surkh-Posh Bukhari was presented by Syed Pahlwan Shah’s elder brother Syed Gul Badshah who was both a worldly and spiritual head of his followers. Syed Pahlawan Shah was against the British rule in the Sub-Continent and his consistent resistance towards English Lords made him an alarmingly acclaimed figure for the British Political Agents in Kurram Agency . He and his followers proved as a lead wall against the tyrannic rules and laws of the British in the Tribal Areas of Kurram and Orakzai Agencies . His self evident miracles made him a legendary figure among his followers in both of the Tribal Areas. There are magnificent tombs of Hazrat Jalaluddin Surkh-Posh Bukhari descendants and disciples all across Punjab, Sindh and Khyber Pakhtunkhwa. These include Hazrat Jahaniyan Jahangasht, Hazrat Rajan Qittal; Hazart Shah Esa Qital (Biloot), Bibi Jawindi (c. 1492 CE, she is great grandauther of Hazrat Jalaluddin Surkh-Posh Bukhari ), Hazrat Mir Mohammad Masoom (Forefather of Jam Bokhari Naqvi family) and Channan Pir among others. Tomb of Bibi Jawindi and tomb and Mosque of Jalaluddin Bukhari are on the tentative list of UNESCO World Heritage site since 2004, they are also listed in the 1998 World Monuments Watch by the World Monuments Fund, and again listed in 2000 and 2002. Many of his disciples are buried in Bhambore and Makli near Thatta. There were many religious leaders and sufia saints in his lineage. Among them Hazrat Shah Mohammad Ghouse migrated from Uchch and settled down in the Punjab, Hazrat Shah Jamal of Ichchra, Lahore’ and numerous others. Part of his family moved back to Turkistan and there were inter-marriages with the Tatar Mongol ruling clan of Bukhara. . It is said that he was married to Genghis Khan’s daughter as well. A branch of the family moved subsequently to what is now Bursa in Turkey..
One of Syed Jalaluddin Bukhari’s descendants, Makhdoom Syed Fateh Muhammad Shah Bukhari al-maroof Ghazi Baba, travelled to Peshawar, and settled down in western suburbs of Peshawar in a village called Wadpagga Sharif. Syed Fateh Muhammad was the 15th descendant of Syed Nasiruddin Mehmood, who was the son of Makhdoom Jahanian. He had six sons, the eldest being Syed Abdul Wahab Shah, while the youngest one was Syed Abdullah Shah. Four of Makhdoom Syed Fateh’s sons settled down in Wadpagga Sharif, while the other two moved to nearby areas, where they settled down. Wadpagga Village comprised predominantly of Bukhari Syeds and the Shrine of Ghazi Baba is the site of attraction of millions of his disciples, where they hold an annual Urs. Ghazi Baba is a contemporary of Mian Omar, a saint buried in Chamkani village in Peshawar. Some of the prominent elders of wadpagga village include Syed Rifaqat Ali Shah Bukhari, Syed Sadaqat Hussain Shah, Pir Syed Qaim Shah Bukhari, Makhdoom Syed Dawood Bukhari and Makhdoom Syed Basharat Ali Shah. The word “Jam” means Sardar, which is derived from Sindhi ancient language. There are two clans of Jams. One clan consists of Jams in Balochistan and Sindh. They are from the Jamoot tribe. Another clan lives in Multan and surrounding areas, especially Jams of Dreg, D.G Khan. These are the descendants of Hazrat Sayyid Bahauddin Mohamed Masoom who is of the 22 sons of Hazrat Jalaluddin Surkh-Posh Bukhari and trace their origin to Uch Sharif. Hazrat Sayyid Bahauddin Mohamed Masoom is the source of information about “Mith Waly” in Multan. He is the descendant of Hazrat Hassan Jalaludin Bokhari, so the people belonging to this lineage are called “Jam Bokhari Naqvi”. Mostly they live in the Multan City, in an area called “Shah Yousaf Gardez Mohallah” and known as “Mithy Waly”. The figures shows that the forefathers of Jam Bukharis Naqvis (Mithy Waly), that live in the heart of the Multan city came from Dreg, Dera Ghazi Khan, because of the uncertain conditions there and starting to live besides the very famous place of Multan City, the Mizar of Hazrat Shah Yousaf Gardez R.A after arriving to Multan from Dreg. The three famous Bazurgs of this lineage are Mitha, Kura and Mohabbat shah. Mohammad Mitha and Mohammad Kurra both are the sons of Jam Mohammad Osman Shah of Dreg. He was a reputable person of his territory. He was a very pious and God fearing man. Mohammad Osman’s family lineage traced to Hazrat Sayyid Bahauddin Mohamed Masoom R.A, Uch Sharif, who was the son of Syed Hassan Jalaluddin Bukhari. After the death of Jam Mohammad Osman Shah; the head of the Jam Bokhari Naqvi family, people raised against his family. He had two sons and three daughters. Mitha and Kurra were his sons. Family of Mohammad Mitha is known as “Mitha Family” and family of Kurra is known as “Khurra Family”. By seeing the unfavorable conditions, both brothers escaped from Dreg and migrated to Multan and started to live here. One of his cousin Mohabbat Shah also escaped with them. Multan,“Kury Wala”, became associated with the name of Kura. Muhammad Mitha, Muhammad Kura and Mohabbat Shah are buried besides “Bagh Langy Khan” which is famous with the name of Langy Khan. He was buried in a small town outside Uchch, but his tomb was damaged by floods, so in 1617 CE, his shrine was rebuilt in Mohalla Bukhari in Uchch by the Nawab of Bahawalpur, Bahawal Khan II. In the 18th century, the Abbasi Nawabs annexed Uchch into the princely state of Bahawalpur. The shrine lies a short walk away from the cemetery and is also built on a promontory, so one can look out onto the rolling plains below and the desert in the distance. To one side is an old mosque covered with blue-tile work and in front of a pool of water is the tomb proper. A carved wooden door leads into the musty room containing the coffin of Hazrat Syed Bukhari.